A challenge to Brexit should "leapfrog" the usual legal process and go directly to the Supreme Court, Northern Ireland's top lawyer has said. In an unprecedented move, Attorney General John Larkin QC said a case being brought by a cross-party group of MLAs should skip NI's Court of Appeal. A British government lawyer warned it could be a "treacherous shortcut". 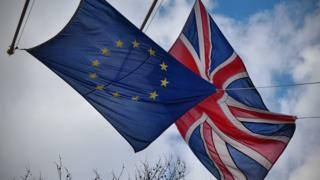 Two NI-related cases against Brexit were heard together and then dismissed by a Belfast judge last month. One case was taken by victims' campaigner Raymond McCord and the other by the group of Stormont politicians, which includes Alliance MLA David Ford, SDLP leader Colum Eastwood, Sinn Féin MLA John O'Dowd and Steven Agnew of the Green Party. While Mr McCord and the politicians have the right to take their cases to the Northern Ireland Court of Appeal, both are asking the judge to refer them directly to the Supreme Court, the final court of appeal in the UK for civil cases. At the outset of Tuesday's hearing in Belfast, Mr Larkin informed the legal parties he intended to refer part of the politicians' case to the Supreme Court. He said his powers as Stormont's chief law officer enabled him to refer devolved matters to the court. Mr Larkin said he believed it was the "first such invocation" of the power in any of the devolved regions. A lawyer for the government said that if the politicians' case was fast-tracked, then Mr McCord's challenge would be left to "lag behind". He said the government did not want to arrive at the Supreme Court with other matters outstanding in other courts. "What appears to be a shortcut could be a treacherous shortcut in terms of the overall resolution of the issues," he said. The lawyer for Mr McCord, whose son Raymond Jr was beaten to death by the UVF in 1997, expressed concern at the attorney general's decision. He said: "We say the case made by Mr McCord goes much further and is potentially much more significant and harmful." The judge noted he had no power in respect of a direction by the attorney general. However, he said he wanted to be satisfied that the referral itself was lawful. He gave parties 24 hours to lodge further written applications. The UK voted to leave the EU by 52% to 48% in June's referendum, though Northern Ireland voted to remain by a 56% majority. In October, the judge dismissed bids by Mr McCord and the MLAs to halt the UK's planned departure from the EU. They argued the Good Friday Agreement and peace process meant there must be a Parliamentary vote if Northern Ireland was to leave the EU. But the judge ruled there was nothing to prevent the government triggering Article 50, the formal legal process for leaving the EU. However, last week the High Court in London ruled that Parliament must vote on whether the UK can start the process. The government will appeal the decision at the Supreme Court, and the case is expected to be heard in December.